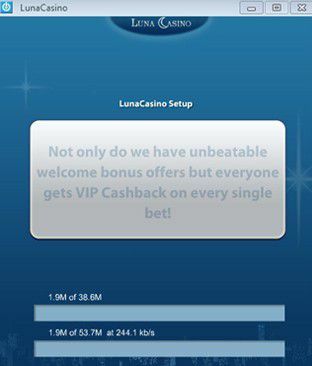 Click here to start installing the LunaCasino software. 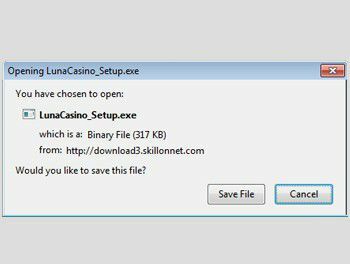 Clicking on the download button will lead to the installation of the Windows compatible casino software on your PC of around 120 MB, which will enable you to register and play on our casino platform. ﻿ The File Download window appears. Click "Run" (or "Open"). Click on "Run" (or "Open") again. In some versions of Windows this window will not appear. The Language window appears. Select your preferred language for installation. 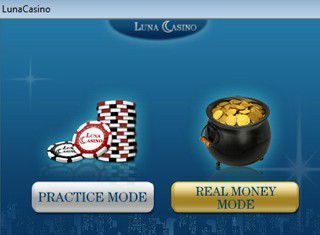 The LunaCasino Installation window will appear. Please allow a few moments for the download and installation process to be complete. Once the download and installation has been completed, the License Agreement window appears. Please read through the Terms and Conditions. To proceed with this installation, click Accept. 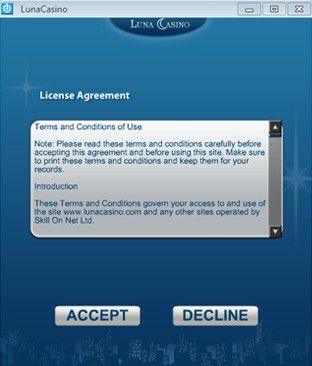 Once you have accepted the Terms and Conditions, the Choose Game Mode window appears. Please select which mode you prefer to begin playing. 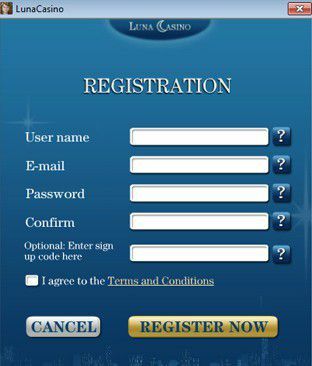 If you would like to play with real money, you will be required to enter your contact information and credit card details or other payment information. Once you have chosen which mode to begin playing, the Registration window appears. Please complete all the fields in English. Ensure all fields are entered correctly and with accurate information. Ensure the email address you provide is active, and entered correctly. The application can be uninstalled completely and cleanly using the normal remove programs options in Windows. No functions of the software will remain after uninstalling. Read more here.